I only wear glasses for reading, so I am constantly taking them on and off, and it seems like my glasses are constantly getting dirty. I’ll be having trouble reading something and notice that there is a big fingerprint right in the middle of my vision. I’m probably not the only one with this problem, so we thought we would share what we have learned about keeping my glasses clean and how to make your own eyeglass cleaner very cheaply. Unfortunately, commercial eyeglass cleaners contain lots of preservatives and other chemicals that can be irritating to your eyes. They are also expensive. So, we have experimented with ways to keep my glasses clean, and we are sharing what we have learned with you today. We hope these methods and recipes work for you as well as they did for me. You’ve paid a lot of money for those glasses, so take the time and consideration to clean them properly. Know what materials your glasses are made of and the recommended way to clean them before you start. Alcohol or other solvents can damage some glasses made of special materials or with a special coating, so check with your manufacturer for special instructions. If you have dropped your glasses, or otherwise gotten them dirty or gritty, you don’t want to start rubbing them. You could end up scratching the lenses and making the situation worse. In this case, washing with a soapy water mixture is the answer. Add a couple of drops of liquid dishwashing detergent to a bowl of water and stir it to mix. Hold your glasses by the sides and gently drag them through the soapy water. Rinse them and gently dry with a clean cotton cloth. Soapy water is also the best homemade eyeglass cleaner for coated lenses, especially anti-reflective, anti-fog, or anti-scratch coatings. With these coatings, the manufacturer often recommends that you avoid using alcohol or ammonia. This homemade lens cleaner works well to clean off grease, smudgy fingerprints, and the daily grime that seems to accumulate so quickly on your glasses. We like to mix homemade glasses cleaner up in a small spray bottle and keep it beside my reading chair. This way we can clean my glasses before I get started on a good book. The recipe below is based on alcohol, same as our homemade window cleaner recipe. To use this cleaner, mix the ingredients in a small spray bottle and spray onto both sides of your dirty glasses. Polish them clean and dry with a microfiber cloth. 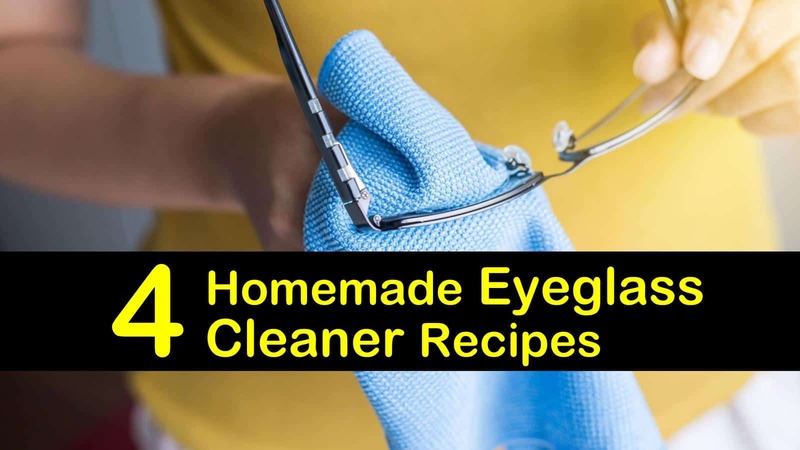 If you’re constantly getting your glasses fogged up when cooking or exercising outdoors, this steam preventative homemade eyeglasses cleaner may be the answer. You can keep a travel sized spray bottle of this cleaner in your pocket whenever you are outdoors and reapply as needed. To use this anti-fog cleaner, mix all the ingredients in a spray bottle and apply to both sides of the lenses. Wipe the cleaner off with a lint-free cloth. Wait a minute before putting your glasses back on so that the glasses are completely dry. Be careful not to spray the cleaner in your eyes; it will burn. This recipe couldn’t be simpler. Based on our glass cleaner recipe, mix 1 part water and 3 parts distilled white vinegar in a spray bottle. Spray your glasses and buff them dry with a clean microfiber cloth or a cotton cloth. This simple solution cuts through grease to clean your glasses and also discourages condensation from forming on your glasses. Reapply as needed. Here is another recipe for a DIY eyeglass cleaner that uses vinegar as an anti-fog ingredient. Fill your spray bottle with one part vinegar, 1 part rubbing alcohol, and 1 part distilled water. Shake it up and start cleaning. I admit I used to be guilty of this one myself. So many people clean their glasses by exhaling onto the lenses then wiping the fog off on their shirt-tale. This common practice can easily scratch your glasses. One tiny scratch today, another tomorrow, and soon you see poorly again with no clue what happened. Take the time to clean your glasses properly to protect your eyesight and your investment. When cleaning your glasses, make sure that any cloth you use is completely clean. Do not use paper towels, newspaper, or other paper products, over time they will scratch your lenses. Also, avoid cloths that have been dried with fabric softener, it can leave a film on your glasses and cause smudging. The best choice is to use a microfiber cloth, 100% cotton cloth, or an eyeglass cleaning cloth made specifically for that purpose. The best eyeglass lens cleaner for you depends on what your glasses are made of and whether you have any added coatings. The best solution is to consult your glasses provider and follow their recommendations exactly. 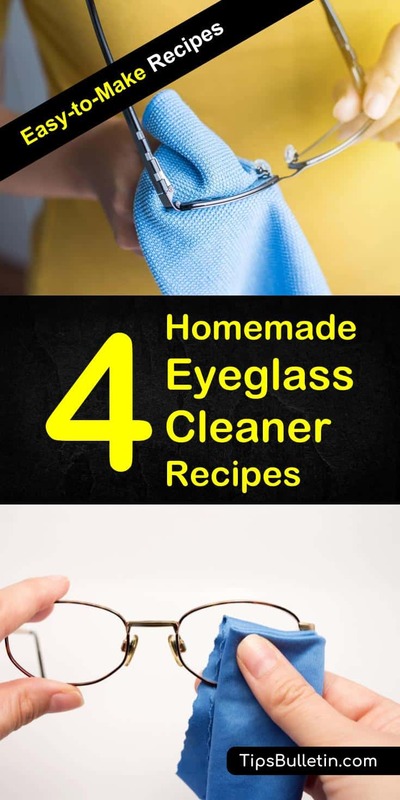 But you don’t need to buy their expensive eyeglass cleaning solutions, one of these recipes will work for any glasses or sunglasses. If you are in doubt about what is allowed for your glasses, stick with the soapy water wash. You can’t go wrong cleaning your glasses with soapy water, as long as you use a clean microfiber cloth or a 100% cotton cloth to dry them. Use distilled water if you live in an area with hard water and water spots are a problem, but if you buff them completely dry, this shouldn’t be a problem. I hope one of these recipes works for you. I have tried them all and know that they work. It is just a matter of choosing the best solution for you and your glasses. Do you have a different method that works for you? If so, please share it in the comment section so that others can learn from your expertise. When we share our tips and solutions, it makes life easier for everyone. Please take the time to share this article on social media, if you found it helpful. By sharing it, you help get the word out to those who may need it most.